Rajasthan PTET 2019 - Government Dungar College, Bikaner (Rajasthan) has released advertisement for Pre-Teacher Education Test (PTET-2019) for admission into B.Ed. Courses for the duration of 2 years for academic session 2019-20. To know more about Rajasthan PTET details, like eligibility, application form, candidates can go through this notification. Also known as Rajasthan PTET or Rajasthan Pre B.Ed. B.Ed. Courses: Candidate should have passed Bachelor’s Degree from a recognized University with 50% for unreserved category and 45% for reserved category. Integrated BA B.Ed./B.Sc. B.Ed. : Candidate should have passed in Senior Secondary (10+2) Examination or equivalent examination from any recognized Board of India. The candidates are required to go through the 10+2+3 scheme of education pattern, else the candidates won’t be allowed to sit for the exam; the candidates who have appeared for the final year exam can also apply for this test. Candidates will be granted admission on the basis of their performance in the Rajasthan PTET 2019 exam. Applications for B.Ed. Rajasthan 2019 have started from 14th February 2019. The candidate can go to the official website of www.ptet2019.org to apply. From here you can easily apply. Qualification for B.Ed. is most essential for Rajasthan B.Ed. application. Applicants should apply only according to eligibility criteria. While applying for Rajasthan PTET 2019, the payment of B.Ed. fees is also to be paid. Applications without application fees will not be considered valid. Payment of application fee will be done online. Candidate can deposit fee through Online Payment Gateway using Debit Card/ Credit Card or Net Banking facility or through e-challan in bank of ICICI. Candidates who have applied for Rajasthan PTET 2019 the entry letters of those candidates will be released on the official website. 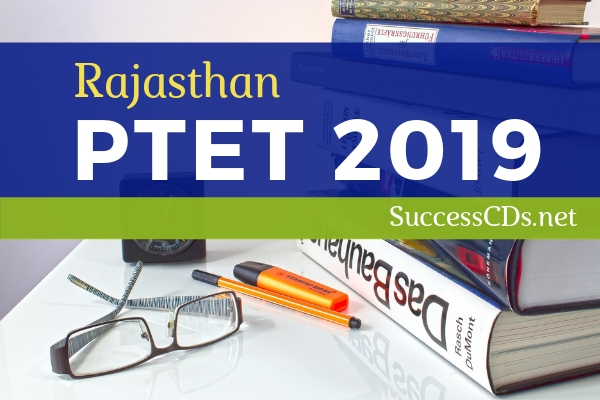 Rajasthan PTET 2019 entry forms will be sent by post to any candidate. Therefore, the candidate will be able to download from the website ptet2019.org upon issuing the admission letter. Apart from this, candidates will also be able to get Admit Card from this page. After downloading the candidate, take out his printout. Without permission, the BEd Rajasthan 2019 examination will not be allowed to be given.